Having radiant skin is for me definitely the most important thing in the world. I want that people are blinded by my stunning beauty when they look at me directly and I also want my complexion shine like a pearl shining on the beach. And you have probably guessed by now that highlighter is one of my all-time favourite beauty products. A high-quality highlighter is a really essential beauty product and I have few most-liked which I use in my daily makeup routine. While all these highlighters have different formulas, finishes and applicators, they have one thing in common – they are all very costly. But when it comes to my beauty products I am only going to use the top products. But I have great news for you, you can get terrific product and you don’t have to pay a lot of money. There is a highlighter that you can find in a drugstore which provides a beautiful luminous glow which is so effective that it matches even the most expensive product in my beauty collection. But there is something strange about this product. It is not a real highlighter. 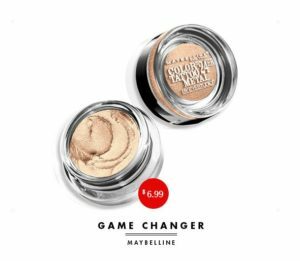 I want to tell you about Maybelline Color Tattoo Metal 24hr Cream Gel Shadow in Barely Branded. It is actually an eye shadow but I use it as highlighter and it is perfect. When I used it as an eye shadow, I discovered that it was susceptible to sinking into creases and lines…but on my skin? It is impeccable, and it makes my skin shine like sun. In the beginning, I want to say that this is the most perfect color in the world. Barely Branded is a soft beige-gold that actually does the job on every tone of skin. This is the highlighter I would choose if anybody wanted me to do makeup for a special occasion, no matter the tone of skin of the client. It’s a universal highlighter. It will also provide the perfect amount of shine. It is metallic but it isn’t too much metallic. It will give your skin natural radiance and it will not make you look like a robot. If you need a more dramatic look you can layer it and if you want a more subtle shine you should blend it well. I want maximum radiance at all occasions and this is the reason why I love to do a combination of these two. Please don’t think I am crazy. It is really simple to apply it. You should use your fingers to dab it on and tap to blend. You don’t have to learn any complicated highlightening techniques and use brushes to clean. And when you set this product it will last (this is not the case with most of other cream highlighters). If you have stopped using cream highlighters because they leave strange marks on your cheeks and they never completely adhere to your skin, please raise your hand. Of course, almost everybody…but this is not the case with Barely Branded. It’s a perfect for hot and sweaty summer days. And what is the best news? It doesn’t cost much (less than 10$) and one jar will last forever. This is the best highlighter for you if you don’t want to use expensive products but you want to illuminate your skin. I want to thank Maybelline for my perfect summer complexions.